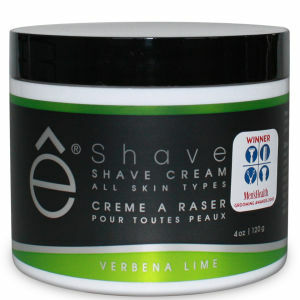 eShave Verbena Lime Shave Cream has been voted Best Shave Cream for 2010, by Mens Health Magazine! This super-concentrated shave cream is the perfect blend of refreshing Lime and hydrating Verbena Extract, ideal for all skin types. Natural botanicals within the light texture each deliver their own therapeutic benefit to soothe, invigorate, rejuvenate, firm and tighten the skin while shaving. This rich lathering cream contains proven skin care qualities, leaving skin smooth, toned, and comfortably soft, eliminating irritation. Apply a dab of Shave Cream to your face using your fingers or a Fine Badger Shaving Brush. Shave after showering and use warm water to obtain better results. Prepare your skin with the Verbena Lime Pre Shave Oil before applying Shave Cream and follow with the Verbena Lime After Shave Soother for a great shaving experience.